Language Log: Who is the decider? In his Bizarro cartoon panel for April 22, 2006, Piraro takes a worthwhile shot at couples who inflict their self-written wedding vows on their guests. 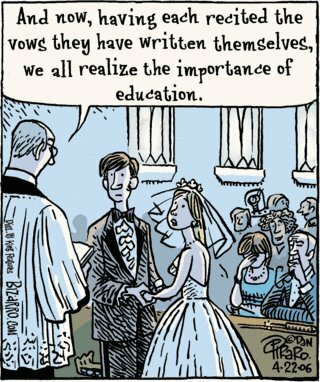 ... [T]ake a look at the minister's words: “And now, having each recited the vows they have written themselves, we all realize the importance of education.” Whoa, what a burn on the feckless bride and groom! However, ... what exactly is the referent for the participial clause “having each recited the vows they have written themselves”? It's obviously supposed to be the bride and groom, but the actual subject of the sentence is “we,” the spectators and the celebrant at the wedding. Piraro has committed misplaced modification and left a participial phrase dangling. You are never more likely to make a grammatical error than when correcting someone else's grammar. 2. Piraro imagines that the minister is using the dangling adjunct on purpose, as an echoic criticism of the couple's home-made vows. Under interpretation #1, the minister falls victim to Zeno's "Iron Law"; under interpretation #2, no one does. Under either interpretation, the cartoonist Piraro himself is innocent of linguistic fault. When I first read the cartoon, I interpreted it in mode #2; after some reflection, I switched to mode #1; I didn't think of Zeno's interpretation until I read his blog entry. What do you think? Where did the dangling modifier come from? The cartoonist intended us to think that the minister dangled the modifier unwittingly while sincerely praising the bride and groom. The cartoonist intended us to think that the minister dangled the modifier on purpose as an ironic way to criticize the bride and groom. The cartoonist didn't understand that there is a linguistic problem in the caption. In the present instance, it behooves me to keep this post short, thereby reducing the likelihood that I will commit some egregious error therein. When you, Dear Reader, find the inevitable faux pas, please try to be gentle as you denounce my sin in the comments. Jed Hartman ("Words & Stuff", April 20, 1999): "Any article or statement about correct grammar, punctuation, or spelling is bound to contain at least one eror". Perchprism/Skitt: (alt.usage.english, April 26, 1999): "Any post correcting an error in another post will contain at least one error itself" or "The likelihood of an error in a post is directly proportional to the embarrassment it will cause the poster". Erin McKean: (Verbatim Magazine, Summer 1999) "Any correction of the speech or writing of others will contain at least one grammatical, spelling, or typographical error." In neither taste nor precision is any man's practice a court of last appeal, for writers all, both great and small, are habitual sinners against the light; and their accuser is cheerfully aware that his own work will supply (as in making this book it has supplied) many "awful examples" — his later work less abundantly, he hopes, than his earlier. He nevertheless believes that this does not disqualify him for showing by other instances than his own how not to write. The infallible teacher is still in the forest primeval, throwing seeds to the white blackbirds. When it comes to language, none of us is the decider, and yet each of us is.